Standing Rib Roast, Yorkshire Pudding, Thyme for Cooking holiday recipes. You can get a rib roast small enough for 2... with leftovers. We used to get a 1 - 2 rib roast. If it won't 'stand' just put it on a meat rack. I have no photo as this was our dinner when we lived in the US. Prime rib is not easy to find where we live now. Drizzle Worcestershire over entire roast. Rub with thyme and garlic. Either stand roast or lay it on a rack in a baking pan. Insert meat thermometer. If using one that has a temperature alarm set it for 125F (52C) for rare, 130F (55C) for medium rare, 140F (60C) for medium. Put into 425F (215C) oven. When alarm goes off or thermometer registers 125F (52C) (or whatever temp you choose) remove from oven and cover securely with foil to keep warm and allow to rest for 30 minutes. It will continue to cook another 5 degrees or so while resting, bringing it up to the perfect temperature. When it is done resting, (the resting is important if you want nice, juicy beef - and to make the Yorkshire Pudding) slice and serve. 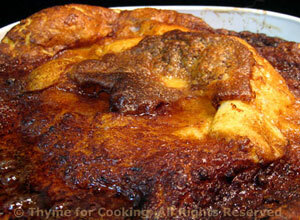 When temperature reaches 115 start to make Yorkshire Pudding; temporarily removing roast to get the drippings. Put Pudding in oven when beef is done. In medium bowl whisk the eggs. Add the milk, flour and salt; whisk. Let rest 10 - 30 minutes. Put drippings/butter and stock in a baking dish. I use a 10 inch (25cm) square. When beef is almost ready to come out, heat the baking dish in the 425F (215C) oven (the same as for roast) until butter is melted. Remove and pour in pudding batter. Immediately take beef out and put pudding in. Oven door should not be opened while pudding bakes. Reduce heat to 375F (190C) and continue baking 12 - 15 minutes more, until golden and puffed up. Crème fraiche can be whipped - and gives a lovely, slightly tangy flavor to the sauce. If you can't get it, substitute regular heavy whipping cream. Put the crème fraiche into a large bowl and whisk until soft and fluffy... maybe even some soft peaks. Whisk in horseradish and herbs.